Dev Sanyal is Executive Vice President, Group Chief of Staff, and a member of the Executive Committee of BP p.l.c. and is accountable for the group’s strategy, risk, planning, government and political affairs, policy, and integration. 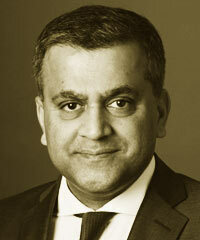 Sanyal joined BP in 1989 and has held a variety of positions globally. After serving in London, Athens, Istanbul, Vienna, and Dubai, he was appointed Chief Executive, BP Eastern Mediterranean Fuels. In 2002, he moved to London as Chief of Staff of BP’s worldwide downstream businesses and the next year was appointed Chief Executive Officer of Air BP, the global aviation fuels, lubricants, and trading business. In June 2006, he was appointed Head of the Group Chief Executive’s Office. He was appointed Group Vice President and Group Treasurer in July 2007. During this period, he was also Chairman of BP Investment Management Ltd. and accountable for the group’s aluminum interests. He was appointed to his current role in January 2012.